Leith Athletic Under-16s overcame Clyde School of Football 3-0 at Meggetland in the fourth round of the Inspiresport Scottish Cup. The match was largely even, with a majority of the game being played in the middle of the pitch. In the 21st minute, Rhys McMurdo’s effort from a free-kick crashed off the upright and bounced out. However, cries of anguish from the home fans were soon silenced as Sulaiman Ashraf was on hand to side-foot the ball into the net. Ethan Wynne looked dangerous in the middle of the park as the lively midfielder made a nuisance of himself. Leith put themselves 2-0 up through Robbie King. The agile winger blasted the ball into the roof of the net after Ashraf’s initial shot could only be parried into his path. Leith took the two-goal advantage into the break as Clyde struggled to create promising opportunities in front of goal. The Leith defence worked tirelessly throughout the match, with Aidan McFarland and Ewan Howie both making crucial tackles in the second half. Throughout the game the Leith attack never slowed. Hungry for another, the last goal came just before the final whistle. Wynne cut the ball across the box to Rory Hunter and his miss-hit shot rolled into the path of Strathy Mackay to poke the ball into an open net. In the under-13s section of the competition, Salvesen defeated Dunbar United Colts 2-0. Lewis Marshall opened the scoring with a low shot from the edge of the box and then a stunning volley from Miko Brown doubled the advantage for Salvesen in the second half. Struan Littlejohn put in a man-of-the-match performance to ensure Salvesen kept another clean sheet, the fifth from their last six games. Elsewhere in the U-13s fourth round, Currie Star came out 2-1 victors in their match against Thistle Weir. Max McKay scored the first for Currie Star. He was brought down in the box only ten minutes into the game, but dusted himself off and slotted the resulting penalty into the bottom right corner. Thistle equalised with only five minutes left of the first half as a speculative shot from outside the box found the top corner. Moments later they were denied going ahead by the fingertips of Currie keeper Danny Hyslop. The second half was just as even as the first, but another penalty proved to be the decider. The initial effort was saved, but Finlay Smith was the quickest to react and converted the rebound to seal the win. 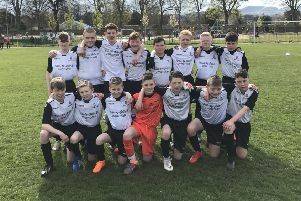 Extra time was needed to establish a winner in the match between Tynecastle U-13s and East Renfrewshire side St Cadocs. St Cadocs raced into a 2-0 lead, but the deficit was reduced to just one shortly before half time as Michael Crichton tucked the ball under the keeper. Tynecastle looked more solid in the second half and pressure paid off when Jamie Hilson equalised. Extra-time was largely an even affair with both teams playing well but unable to find a goal. Just when penalties looked likely, a Fraser Munro free-kick found its way to the back post and was squared back across goal for Blair Rennie to tap in from close range and seal a 3-2 triumph.